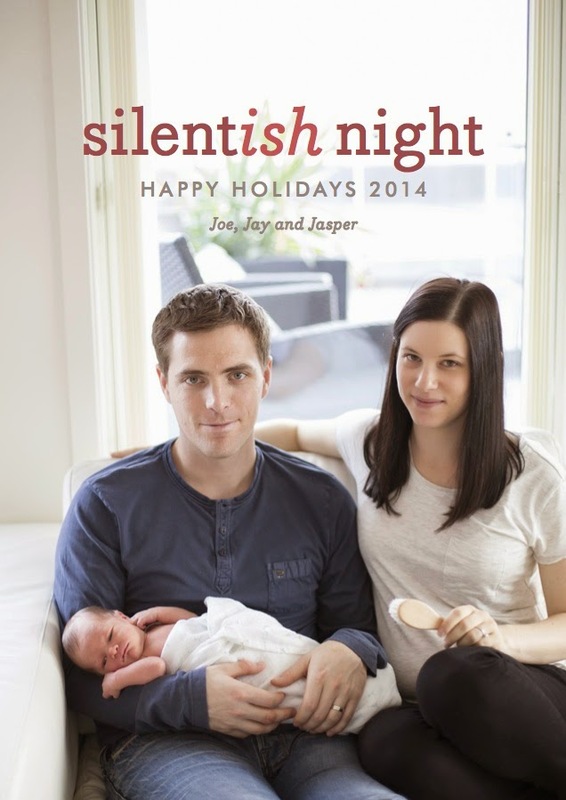 Our 2014 holiday card - Minted, of course. I've written a few posts about transitioning to parenthood that never seem to make it passed the 'Drafts' folder. They seem to get wordy and as I reread them I wonder, "Does anyone really care to hear this?" So I'm going to scrap them - not entirely, I'll look back on them later when I can reflect on these early weeks with Jasper but I'll spare you. The truth is, I'm now a Mom. SURPRISE! (Ha) It consists of everything one imagines motherhood to be. We have good days and we have bad days. Sometimes I feel like we've got a handle on this whole thing and the next we're flailing a bit. But generally, we're doing ok. Jasper is still alive, growing, learning, keeping us on our toes. This week, he turns 10 weeks old. This week he'll also board his first and second flights. He'll land in Canada for the first time and he'll meet a bunch of people that have been impatiently awaiting his arrival. As we organized travel a couple of weeks ago, it struck me that Jasper has never been held by anyone other than his parents and healthcare professionals. The poor kid has no idea what awaits him. It's been nice having this time alone as a family of three. I think a lot of people assume that being away from our family and friends is a bad thing but honestly, for these early weeks as we adjusted, I've been thankful for the space. Sure, there are times where extra sets of hands would have made all the difference and I would have loved our close ones to meet Jasper when he was teeny tiny but it gave us the time to get comfortable in our roles without interference. But we're ready. We're more than ready. I can't wait to watch the grandparents and aunties and uncles see Jasper's big, contagious smile. I also can't wait for someone else to feed me and my arms are excited for a break. There's some trepidation for the flight - 16 hours of travel with a temperamental newborn - and a bit of anxiety as to how Jasper will take to all the ensuing excitement. There will most certainly be overwhelming moments for him but I hope he feels the love. Yes- we care about all that you want to write about! I can only imagine your trepidation about the first flight with a baby, but you guys are seasoned pros at flights so I feel like it'll go fairly well... or as well as can be expected :) Bon voyage to Canada this week! That Christmas card title is hilarious! Love it! Hope the trip goes well and Jasper loves his biologically-native land! Oh you guys this is so adorable. You win best new parent Christmas card of the year! I'll be thinking about you this week as you prepare for the big trip back. It will be just fine!! (And just in case you are anxious about the flight, I heard a story once about a mom who brought lots of tiny bags of chocolates on her flight and gave them to all the people sitting around her on the off chance her baby started crying during the flight - though totally not necessary (he's a baby - he can't help it!) I did love the idea. I have heard of little gifts for fellow passengers and thought about it but Joe is out of town and my to do list is massive and Jasper isn't very helpful;-) Maybe next time! I love your Christmas card! I hope you have a lovely holiday celebrating with your families! Love the card! 16 hours with a newborn. You are sooo brave!!! We are going to wait until ours is 6 months for the first big international flight. Safe travels and Happy Holidays! To be honest, most people tell us the earlier the better as they're sleepier and easier to please with milk. We'll see! Enjoy your stay in Canada. Happy holidays!